LITTLE ROCK, Ark. 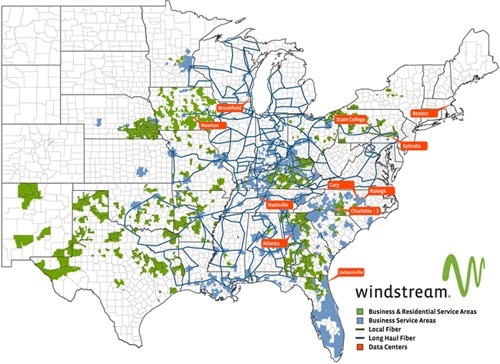 – Windstream Corp. (Nasdaq: WIN) announced today that it has completed its acquisition of Q-Comm Corporation (Q-Comm), a privately held regional fiber transport and competitive local exchange carrier, in a transaction valued at approximately $818 million. The transaction includes Q-Comm’s wholly owned subsidiaries Kentucky Data Link, Inc., (KDL), a fiber services provider, and Norlight, Inc. (Norlight), a competitive local exchange services company. Windstream issued approximately 20.6 million common shares valued at $273 million based on Windstream’s closing share price on Dec. 1 of $13.24, and paid approximately $279 million in cash as part of the transaction. Windstream also repaid approximately $266 million of Q-Comm’s total outstanding net debt. Windstream financed the transaction with cash and proceeds from a bond offering in October. KDL provides long-haul and metropolitan fiber services to a diverse base of bandwidth intensive customers, primarily serving wireline and wireless carriers, as well as the large enterprise, government, education and medical markets. KDL’s contiguous fiber network spans nearly 30,000 fiber route miles in 23 states and the District of Columbia. Norlight is a competitive local exchange carrier that serves approximately 5,500 small and medium size business customers in Indiana, Kentucky, Tennessee and Wisconsin. Windstream expects to achieve annual operating expense and capital expenditure synergies of approximately $25 million. Stephens Inc. and BofA Merrill Lynch acted as financial advisers and Bryan Cave LLP acted as legal adviser to Windstream on the transaction. RBC Daniels acted as financial adviser and SNR Denton US LLP acted as legal adviser to Q-Comm. Waller Capital Partners, LLC acted as a financial adviser to Q-Comm’s Norlight, Inc. subsidiary in connection with the transaction. Windstream claims the protection of the safe-harbor for forward-looking statements contained in the Private Securities Litigation Reform Act of 1995. Forward-looking statements, including statements regarding the expected benefits of the acquisition, are subject to uncertainties that could cause actual future events and results to differ materially from those expressed in the forward-looking statements. These forward-looking statements are based on estimates, projections, beliefs and assumptions that Windstream believes are reasonable but are not guarantees of future events and results. Actual future events and results of Windstream may differ materially from those expressed in these forward-looking statements as a result of a number of important factors. Factors that could cause actual results to differ materially from those contemplated above include, among others: the possibility that the anticipated benefits from the acquisition cannot be fully realized or may take longer to realize than expected; the possibility that costs or difficulties related to the integration of Q-Comm operations into Windstream will be greater than expected; the ability of the combined company to retain and hire key personnel; and those additional factors under the caption “Risk Factors” in Windstream’s Form 10-K for the year ended December 31, 2009, and in subsequent Securities and Exchange Commission filings. In addition to these factors, actual future performance, outcomes and results may differ materially because of more general factors including, among others, general industry and market conditions and growth rates, economic conditions, and governmental and public policy changes. Windstream undertakes no obligation to update or revise any forward-looking statements, whether as a result of new information, future events or otherwise. The foregoing review of factors that could cause Windstream’s actual results to differ materially from those contemplated in the forward-looking statements should be considered in connection with information regarding risks and uncertainties that may affect Windstream’s future results included in Windstream’s filings with the Securities and Exchange Commission at www.sec.gov <http://www.sec.gov> .